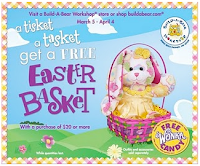 Spend $20 or more at Build-A-Bear and receive a FREE Easter Basket with FREE Wonka candy. Act fast this deal is while supplies last. Offer good until April 4, 2101. My little girl loves to get these FREE reward in the mail. Also make sure you tell anyone buying anything from Build A Bear for your child to make sure the points get added to your child's account. You will need to know the phone number on the account to make this happen.